Today is Pinterest Day for the Babywise Friendly Blog Network and we're all sharing on the topic of budgeting. Follow us on Pinterest for more great tips, or check out the posts from the other ladies directly on their blogs. 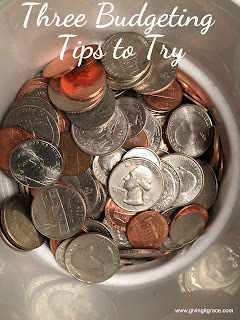 Today I'm sharing three lesser-known tips for managing money. This is not me giving financial advice, but just sharing some best practices that work really well for us - and might work well for you, too! If you're new to budgeting or money management in general, I highly suggest you get started with Dave Ramsey's Total Money Makeover! The Spending account is for our budgeted spending within each pay period: gas, groceries, and general life expenses (aka Amazon Prime purchases!). We operate on a fixed budget every month; any extra money from bonuses or pay raises goes into savings. The Bill Paying account is for all of our bills that need to be paid that pay period. The Short Term Savings account is where money sits that will need to be used soon, but not right away. Examples would be money saved for: Christmas presents, birthday celebrations, home or auto insurance premiums, vacations, or a large purchase. We keep all of this money separate from our our actual savings account (which houses our emergency fund). I like this method because I can easily check the Spending account each morning and have one number to look at to see what is left until the next pay check. My husband receives his paychecks every other Thursday. Bills don't work that way though; bills occur on set days of the month. To keep things predictable and consistent, we only deposit his paychecks on the 1st and the 15th of each month. By doing this, we end up with two extra paychecks every year (usually one in January and one in July). We put those paychecks in our short term savings account to cover all of our home and auto insurance premiums for the entire year, as well as all of Christmas. Seems simple enough, when you have extra money to save right? But what about when you don't have anything extra? Well, you still save $1. Why $1? Because you're still engaged in the practice of saving money. It is common to say "oh I'll start saving again when I'm making more money", but the reality is it's hard to start saving again once you've stopped. If you've been saving all along, however - even if it's only $1 - it is easier to just increase the amount you are saving then to start saving when you haven't been.